Welcome to my Charmed page. I've decided to let this site delete itslef, seeing as I have never really watched Charmed and probably never will. It was last updated on Friday, Sept. 24/99, I wanna see how long it takes to delete. Well no more updates, and no morelink stuff, if u want u're site added to someone elses site, go to a site in the webring and ask. Have fun. Three sisters are brought together in their grandmother's Victorian mansion in a union which will change their lives and destinies forever. There's Prue Halliwell, the beautiful and driven oldest, Piper the earthy, creative middle sister and Phoebe, the free spirited youngest. All of which have lived their entire lives without a clue as to who they really are. The three Halliwell sisters are mysteriously led into the attic, where they discover The Book of Shadows. 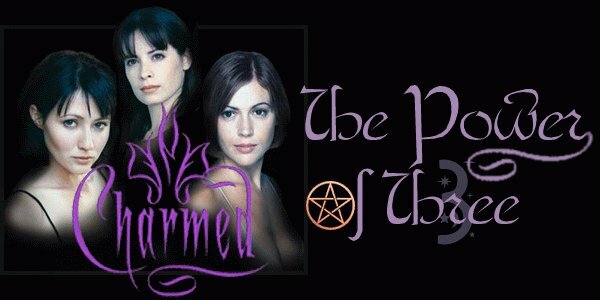 This book of witchcraft defines the role of the Charmed Ones, three of the most powerful witches who will come together to receive their powers on the night of a full moon. With the full moon over their heads, the Halliwell sisters descend the stairs from the attic and into the world of the supernatural. If they are witches, then they need to learn about their newly acquired powers, and they need to learn fast. According to legend, warlocks and demons feast on the powers and lives of good witches. They need to face the truth to survive. These new enemies will stop at nothing to possess their powers, including murder. The sisters' daily struggles will never be the same when they start to grapple with their newfound identity amidst the darker world of the occult. The enchanting Halliwell sisters must learn to come together and use their powers wisely. For when they don't, it's not just their own lives that are at stake. webring is owned by Cat. The Charmed Club Webring is owned by John Weber . Want to join the The Charmed Club Webring? This The Charmed Webring site owned by Cat. Charmed and anything to do with Charmed is property of the WB. No copy infrigment intended. I have decided to have a banner on here for merchandise, well, I suggest that if you really like Charmed and Charmed stuff that you go here and at least check it out, Thanx!